Just completed a little inverse H&S; pattern that targets 1341 on the upside. Close enough to 1346 for my liking. 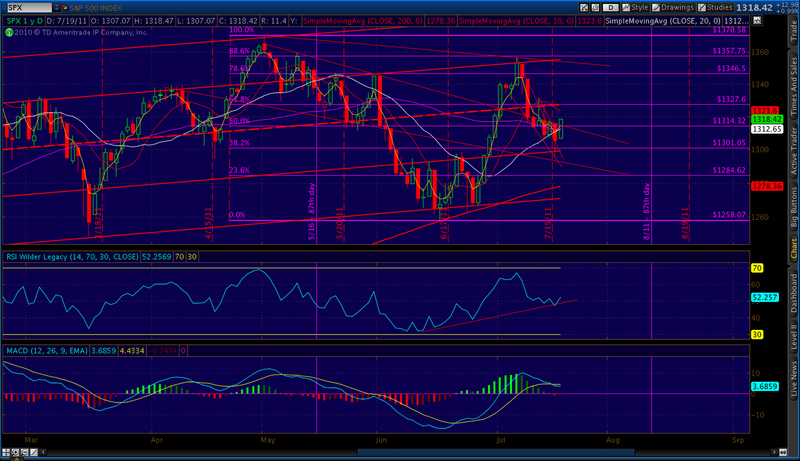 SPX at 1316. 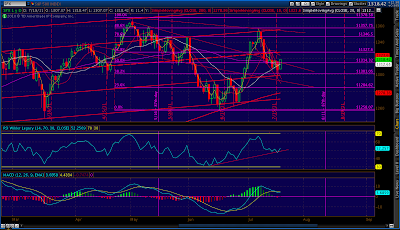 The backtest may be done here at the .50 Fib line. There’s a 50-50 chance that we go all the way back to 1310. I sort of favor that scenario, as it would give us the room we need to do a half-hearted rally on the debt deal news. If it’s the “hand the hot potato to Obama” version that’s being suggested, it won’t be much of a rally at all — as it would probably entail little to no spending cuts. Should get a little backtest of the falling wedge we just broke out of. Might present some day-trading opportunities, as completing the backtest usually results in a trend resumption. For the uninitiated, though, I’ll throw out a reminder that I am extremely bearish at this point. This, in my opinion, should be the last rally we get before the next big move down. And, given that we overshot on the 1356 rally, this one could be much smaller to compensate. Since 1327 is only 10 points away, there is a lot of risk in participating at all. Closing out the bulk of my calls at a nice 2-day profit. The bump up we’ve discussed at length looks to get started in earnest this morning on the strength of the housing numbers. I would hesitate to call this the move, preferring instead a rally based on a debt deal. But, it appears the debt deal will be a watered-down version that might, in fact, be a disappointment rather than cause for celebration. So, a market in need of a rebound will take what it can get. Our lower target area remains1327 — the channel midline and the .618 Fib off the 1370 highs. 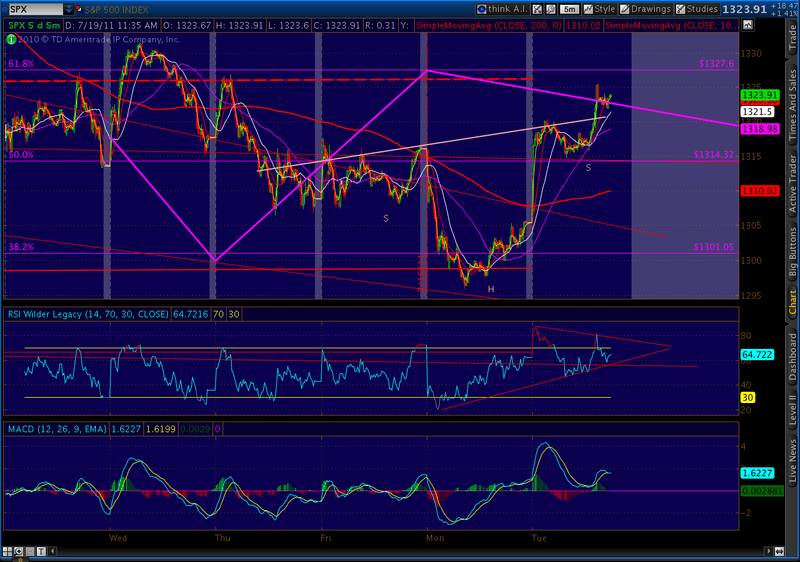 If we break through there, the next stop is 1346.50. At this point, I am doubtful we’ll get there. But, a better than expected bipartisan debt deal that involves real cuts and tax reform would certainly help.